Easily grown in average, medium, well-drained soil in full sun to part shade. Best flowering in full sun. Prefers moist, organically rich soils which drain well. Somewhat evergreen in the South, but generally deciduous in the St. Louis area where stems may suffer substantial damage (including dying to the ground) in cold winters. Significant stem damage can be expected when winter temperatures approach zero degrees F. Best sited in a protected location in the St. Louis area. Blooms on new wood, so prune as needed (e.g., remove stems lost to winter and, if desired, thin to the ground up to 1/3 of old stems) in late winter to early spring. Abelia × grandiflora is a cross between A. chinensis and A. uniflora. 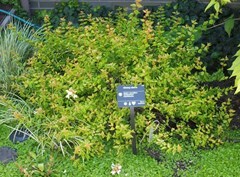 It is a rounded, spreading, multi-stemmed shrub in the honeysuckle family. Typically grows on gracefully arching branches to 2-4' tall in the St. Louis area, but usually taller (to 6' tall ) in the warm winter climates of the South (USDA Zones 8-9). In years where the stems die to the ground in winter but the plant survives, flowering will still occur, but on smaller plants that typically reach a height of only 1-1.5'. Features clusters of white-tinged-pink, bell-shaped flowers (to 3/4" long) which appear in the upper leaf axils and stem ends over a long and continuous late spring to fall bloom period. Flowers are fragrant. Ovate, glossy, dark green leaves (to 1.25" long) turn purplish-bronze in autumn. Genus name honors Dr. Clarke Abel (1780-1826), physician and naturalist, who collected seed and plants as part of a British expedition to China in 1817. Specific epithet means large flowered. 'Kaleidoscope' was discovered by Kent Bell of Marshville, North Carolina in 1997 as a variegated branch sport of Abelia x grandiflora 'Little Richard'. 'Kaleidoscope' is a dense, semi-evergreen, compact shrub with reddish purple stems and foliage that emerges green and yellow, turns gold in summer, and fiery red to orange for fall and winter. The coloration is most vibrant when the shrub is grown in full sun. Its pink buds open into white fragrant flowers that persist into fall. 'Kaleidoscope' grows 2 to 2.5 ft. tall and 3 to 4 ft. wide. Its smaller size makes it suitable for growing in patio containers. United States Plant Patent #PP16,988 awarded August 15, 2006. No serious insect or disease problems. Winter die-back may occur in the St. Louis area. Specimen or grouping or mass for shrub borders or foundations. Also effective as an informal hedge or low screen (plants tend to lose attractive graceful shape if pruned or sheared to a more formal hedge look) in southern areas where winter kill is not a concern. Mass on slopes or banks for attractive shrubby cover and erosion control.